In the early 1950’s, AFSC wrote and published Speak Truth to Power – a document which challenged the basic premise of the Cold War thinking – the “enemy” mentality. The Soviet Union represented all evil, and the US claimed to be the epitome of virtue and good. The pre-eminent belief was that military strength and threatening with nuclear weapons was the only way to deal with the Soviet Union.. The fear of Communism was so prevalent that it pitted neighbor against neighbor, and a rampant era of McCarthyism arose where the House Un-American Activities Committee considered those who questioned the US policyof 100% anti-communism and opposed the Cold War to be communist sympathizers. This approach was based on “us versus them” thinking, and continually led to war and nuclear confrontation. Speak Truth to Power provided a great impetus to Friends, and like-minded people across the nation, to rethink this mainstream way of viewing the world, and to re-consider and promote positive alternatives to this “Cold War” mentality. The only real security, is Shared Security – for all people on the planet. The people of the world need to work together to address the many urgent challenges such as climate change which affect us all regardless of geographic boundaries. It is also imperative that we put an end to war (where 80% of the casualties are now civilians), make the transition to renewable energy, and help create a just and peaceful world for all God’s children – both now and for future generations! This shared security approach, which recognizes our worldwide interdependency, could help create real and lasting security – not only for the people in the US, but for all peoples in the world. Imagine if the US spent even 10% of our military budget working to put an end to hunger, disease and poverty for all people on the planet, it could create real security for all of us. Another 10% could offset all the cuts which state and local governments are making in funding for schools and all social programs which benefit the American people. This would do much more to create real security for the American people than all our nuclear weapons, wars and military bases around the world. War and militarism have failed as a means of resolving conflicts and achieving security. Our current model is not sustainable. Let’s try a different approach. A U.S. diplomatic toolbox of international mediation, monitoring teams, restorative justice, reconciliation and trauma healing would all result in stronger resources for building peace. Shared security calls for more ethical and effective American foreign policies, deep respect for human rights, and new ways of engaging with the world that includes cooperative international problem solving. Friends beliefs and testimonies call us to work actively towards this radical shift in foreign policy and way of relating to the rest of the people of the world. This radical shift in policies of our government will not come about without a broad-based and powerful nonviolent movement where the American people demand this kind of change and call for bringing our tax dollars home. Our current militaristic and “America first” way of looking at the world undermines our national security and the security of all people in the world and is morally indefensible. We, as Quakers, are called to be a “force more powerful” through “speaking truth to power” and engaging in sustained witness and struggle to achieve a world where all people can live in peace and with dignity. Nonviolent movements brought about women’s suffrage, civil rights legislation, ended the Vietnam War, and have overcome dictatorial governments around the world. We can build a movement which can help change our foreign policy to one of Shared Security for all peoples on the planet. Please join us. TOGETHER WE CAN OVERCOME! 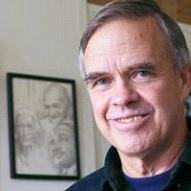 David Hartsough is a member of the San Francisco Friends Meeting, co-founder of the Nonviolent Peaceforce, Director of Peaceworkers and worked for 18 years with AFSC. This entry was posted in Uncategorized and tagged Chuck Hagel, Cold War, McCarthyism, nonviolence, nonviolent movements, shared security. Bookmark the permalink.